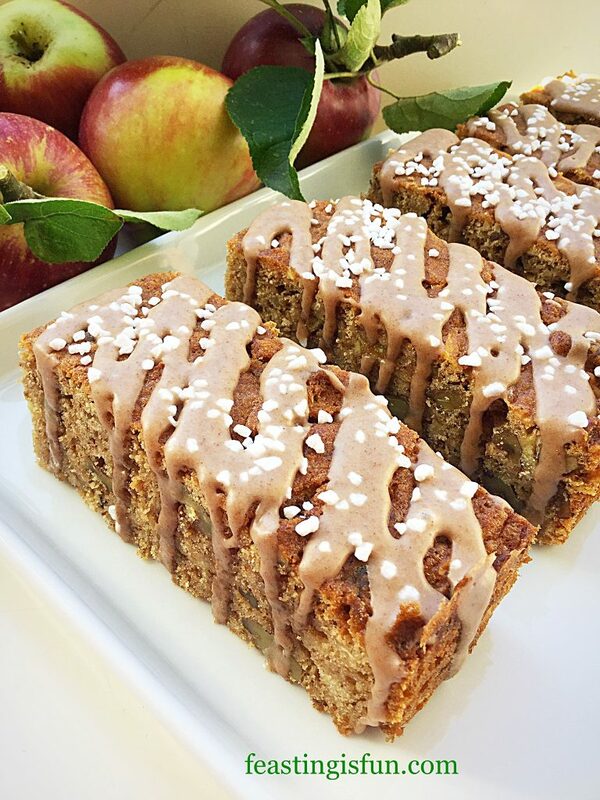 Today I have a real treat for you, my Cinnamon Drizzle Apple Walnut Cake Bars. 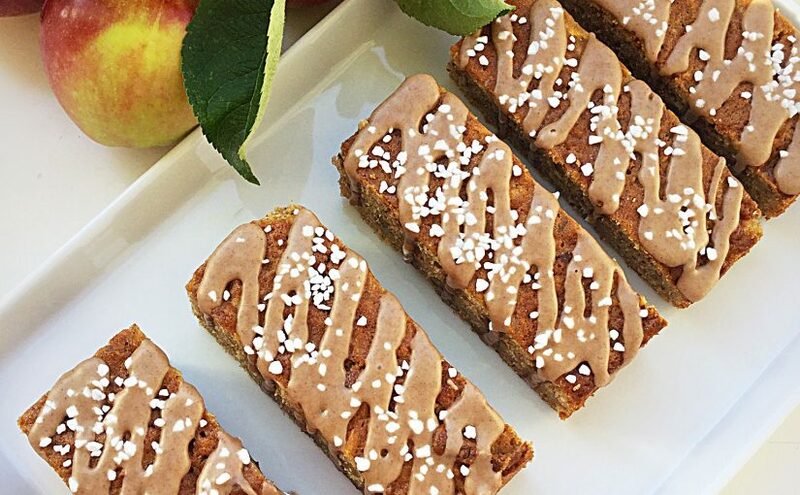 Packed with freshly grated apple and toasted walnuts these cake bars are full of flavour. 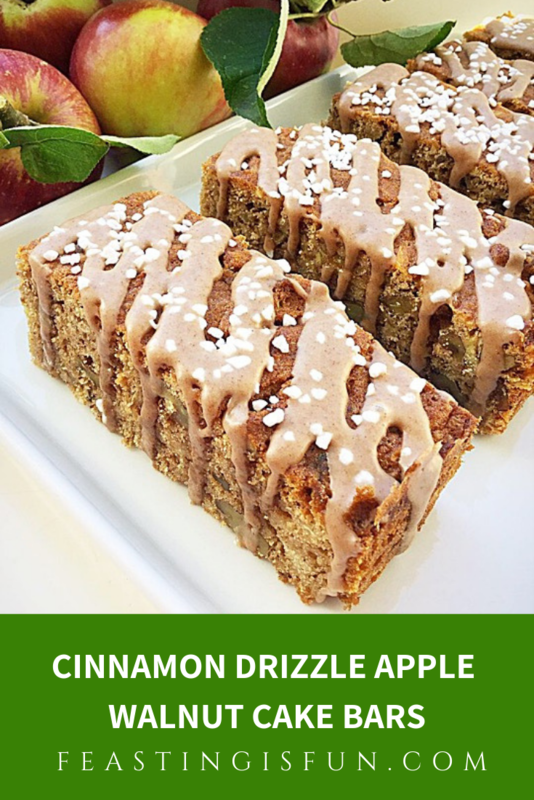 A simple cinnamon drizzle adds just the right amount of sweetness, while the sugar nibs add extra crunch. 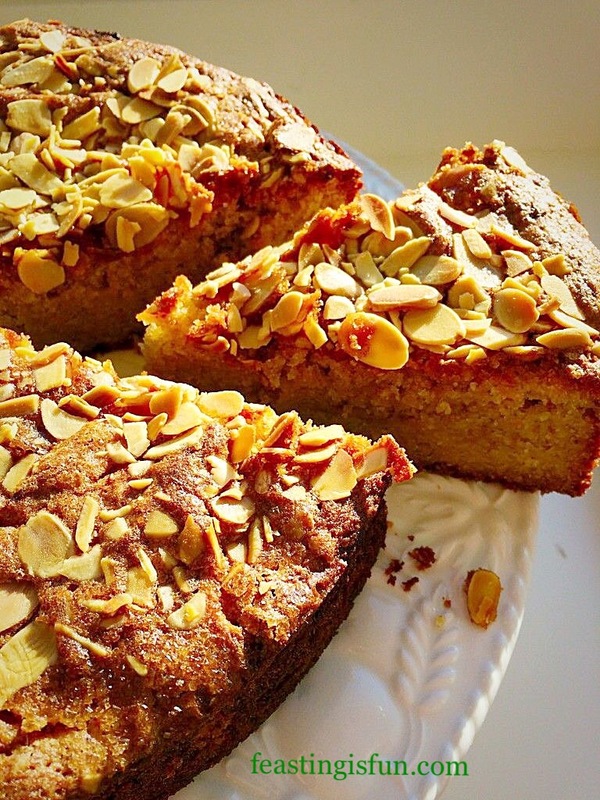 This simple traybake is a treat on the tongue and the senses. I adore Autumn. While gales and rain lash down, there are also the bright, golden sunshine filled days. Because of the variations in the weather, some days are perfect for gardening, having a tidy up, and picking fruit and windfalls. Yet when the weather rages I find comfort in the kitchen, baking delicious cakes that make the whole house smell warm and inviting. 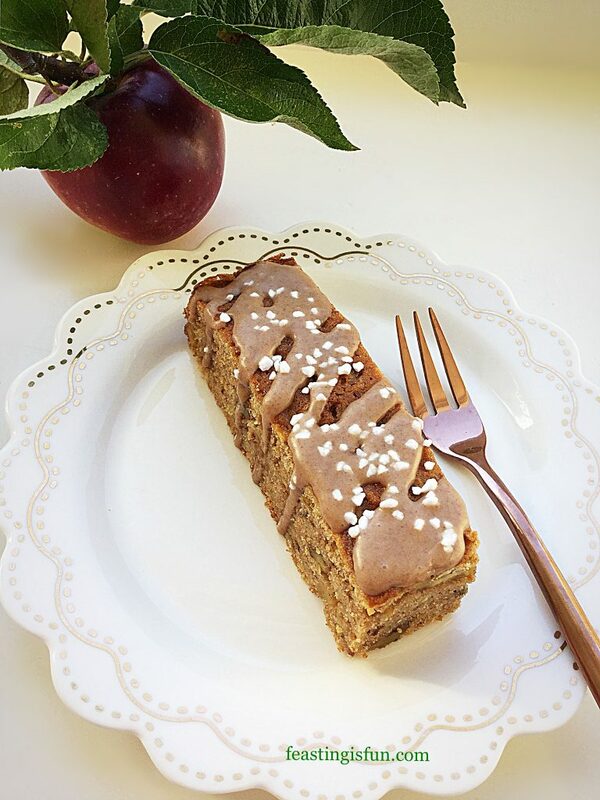 I am even more content when I can include produce from my own garden, such as the apples used in both the cake bars and photographs. Due to the very hot summer we have had this year I wasn’t sure how well our two apple trees would fare. Because of the heat this years apples are sweeter than usual. While both our trees produce eating apples, one usually small, red and sweet, the other red and green, sharper in flavour. Similar to a Granny Smith apple’s flavour. As a result of the summer weather both varieties have a more intense apple flavour and are delicious to eat straight from the tree. Since we have plenty of windfalls from the recent storms I have used them in the recipe. If you have access to windfall apples make the most of nature’s opportunity. 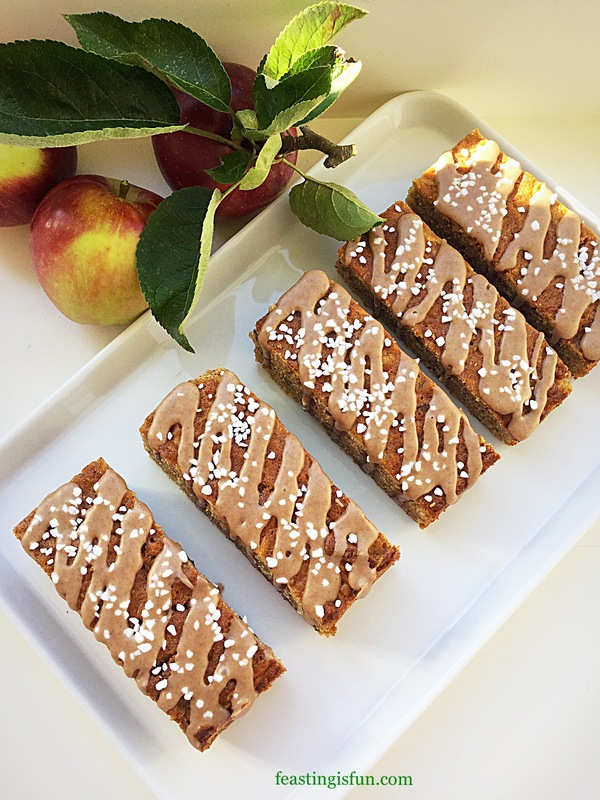 Either use them to make these cake bars or perhaps my Apple Pie? 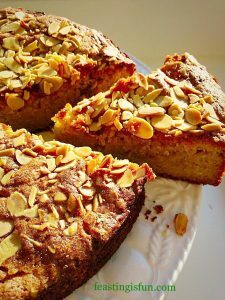 Finally, a quick note, if you like puddings, then I should mention that this cake is delicious served with hot custard! Method: Preheat the oven to 190C/170C fan, 375F, gas mark 5. 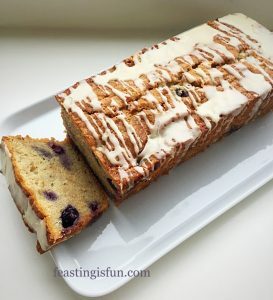 For this recipe you will need a 22.5cm x 30cm x 5cm (9” x 12” x 2”) tin lined with baking parchment. First of all add the butter, soft, light brown sugar and salt to a large bowl. Due to the quantity of ingredients I found a wide bowl easier to use. Beat the sugar and butter together until creamy with no visible lumps. Add the 4 eggs, 75g/3oz of flour and the spices to the bowl. Whisk everything together until fully combined. 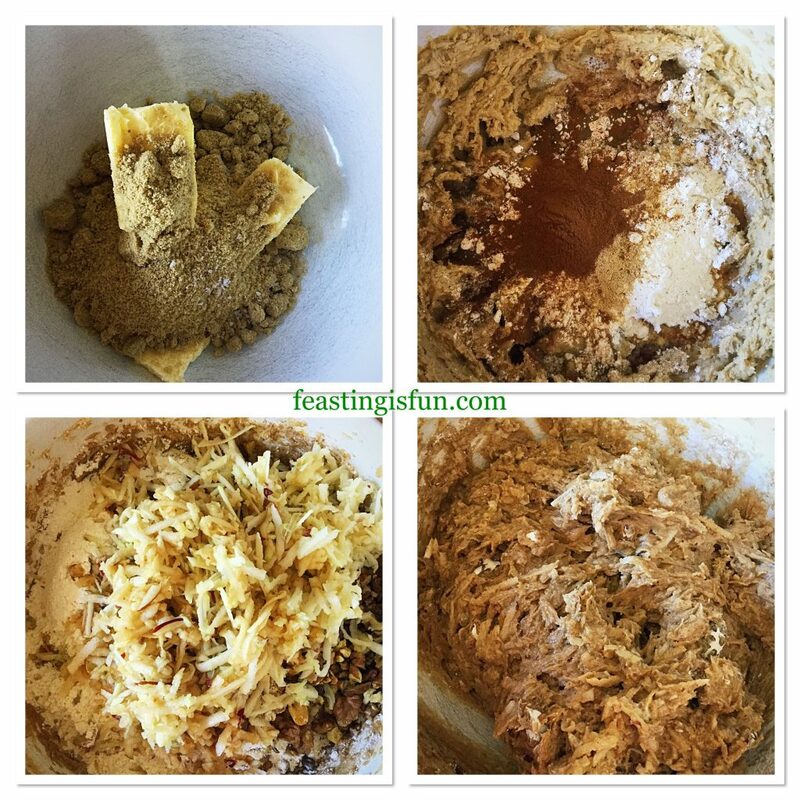 Sieve the remaining flour and baking powder into the bowl and added the chopped walnuts. Because some apples turn brown quickly once cut or grated I add them last. Finally fold all of the ingredients together until they are just combined. Spoon the cake batter into the prepared tin and ensure the batter is even and the top is smooth. 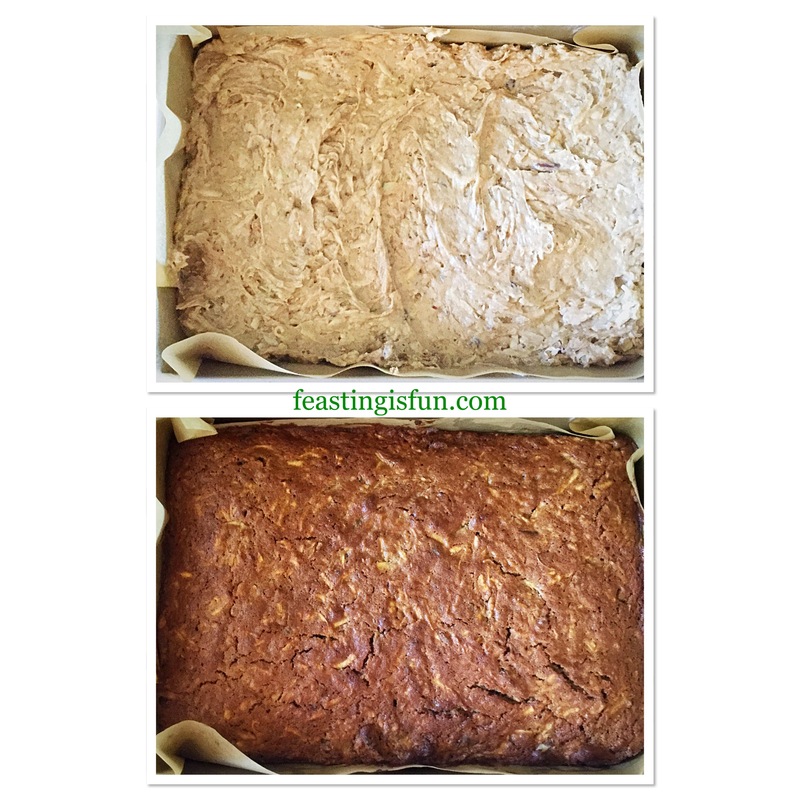 Place the cake tin into the centre of a preheated oven and bake for 40-45 minutes. The cake is baked when it is golden in colour and firm (with only a little give) to touch in the centre. As soon as the cake is baked remove from the oven and leave to cool completely in the tin. Filling the tin and baking the cake. Add the icing sugar and cinnamon to a large jug. Using a balloon whisk, stir the two powders to combine and break up any lumps. Pour 2 tablespoons of cold tap water into the jug and stir using the whisk. Add more water as needed until a thick, not runny consistency is achieved. Decant the cinnamon icing into a piping bag fitted with a small round nozzle. Alternatively use a plastic sandwich bag and just prior to decorating cut a very small hole in one corner, this also applies to disposable piping bags. To prepare the cake for decorating first of all cut across the width of the cake, dividing it in half. Now cut from top to bottom in the middle of the cake creating 4 quarters. Cut each quarter into 4 bars from top to bottom. While you can decorate the cake as a whole, I like to see the drizzle of icing on each cake bar. 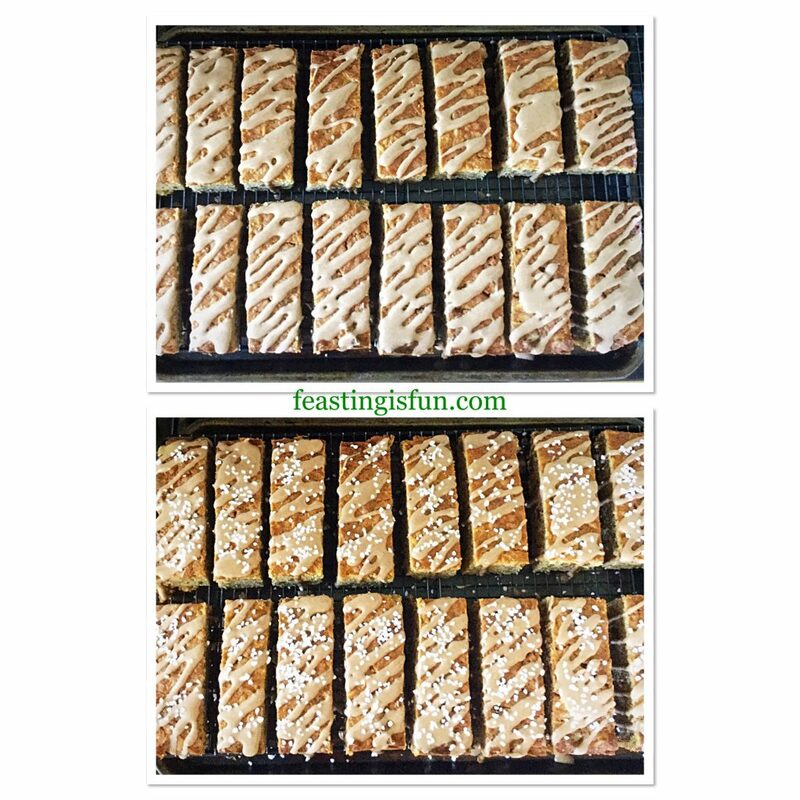 Separate the bars and place on to a cooling rack over a baking tray, to catch any drips. Using gentle, steady pressure pipe diagonally across each cake bar. Continue piping until each bar is iced. Sprinkle some sugar nibs over each bar while the icing is still wet. Place to one side to allow the icing to set. Finally take a photo of your creation! Because your house will smell amazing and these cake bars will not last long. Store the bars in an airtight container. They will keep for 5 days. Refrigerate during warmer weather. The cake can be made a day in advance and decorated the following day. 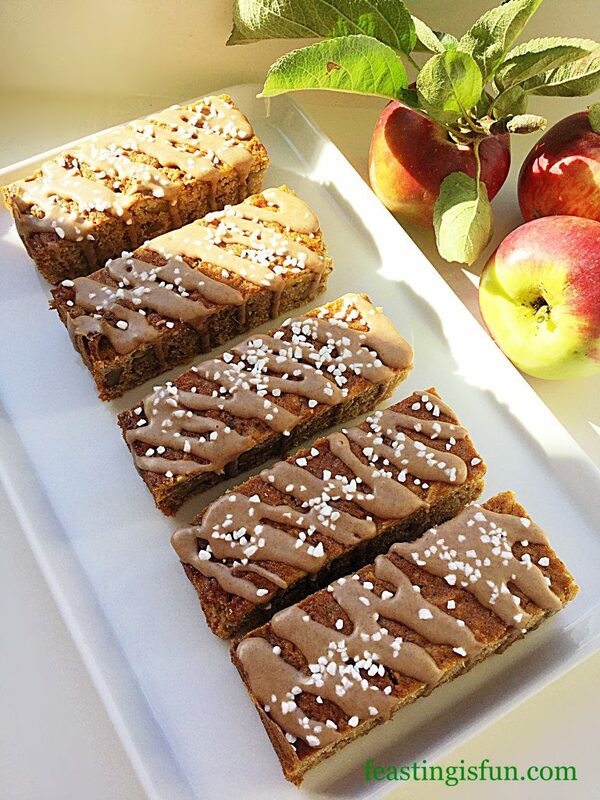 With Bonfire Night, November 5th not far away these cake bars are perfect for sharing. 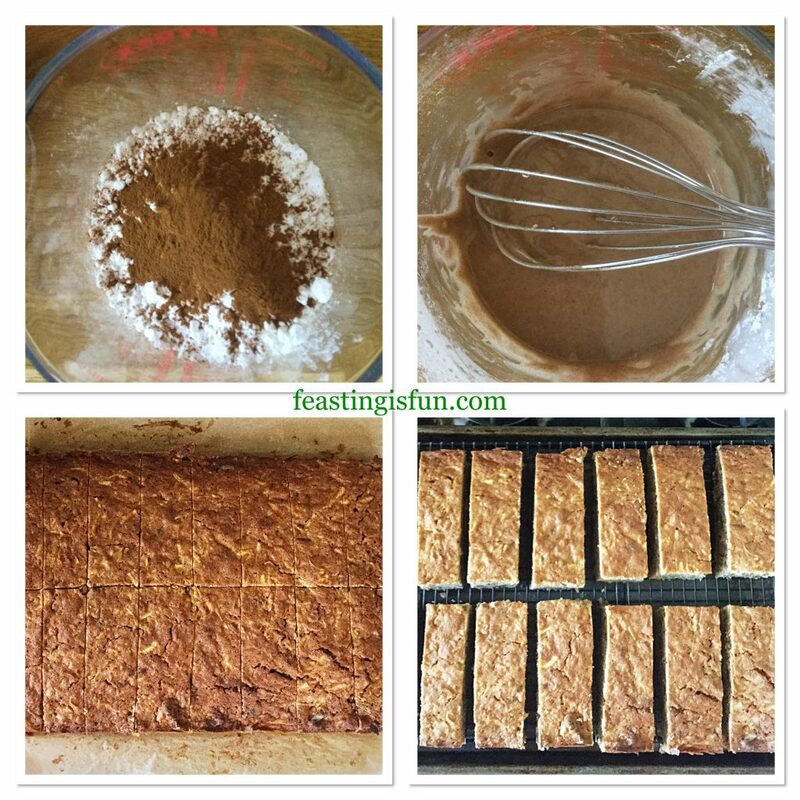 Whether you are going to an organised event, holding a bonfire party in your back garden, or simply watching from your window, everything about these cake bars will elicit oohs and aahs! 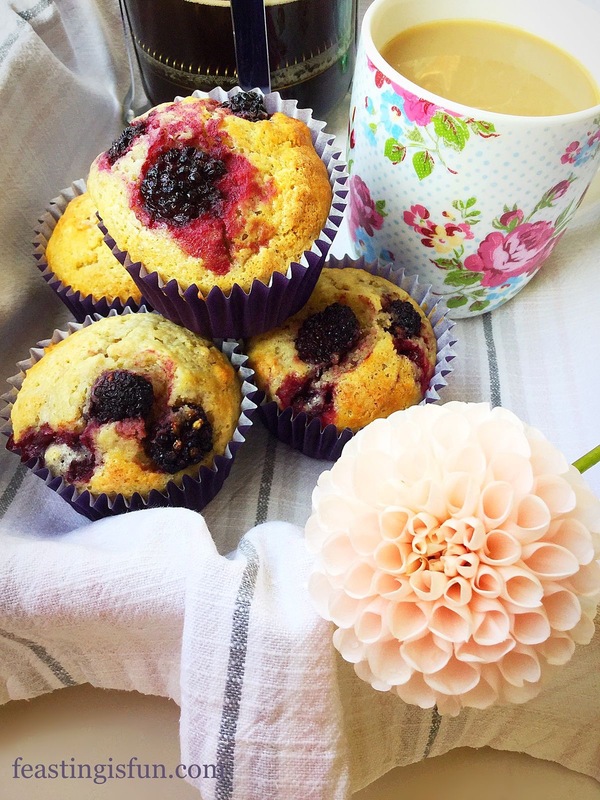 Because they are so yummy, they deserve to be made and enjoyed all year round. Whatever you are making, baking and creating in your kitchens, have fun preparing and sharing your feast. No part of this post may be reproduced or duplicated without the written permission of the owner. Please see my Disclosure Policy for details.